This article is about the club officially named FCSB. For the other team claiming to be the legal successor of the original Steaua București and still affiliated with the multi sport entity and the army, see CSA Steaua București (football). 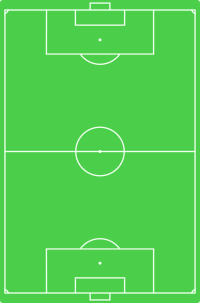 For other uses, see Steaua București (disambiguation). FCSB (Romanian pronunciation: [fet͡ʃeseˌbe]), formerly short for Fotbal Club Steaua București (Romanian pronunciation: [ˈste̯awa bukuˈreʃtʲ]) and sometimes colloquially known as simply Steaua,[note 1] is a Romanian professional football club based in Bucharest. Founded in 1947 as Asociația Sportivă a Armatei București, it has spent its complete history in the Liga I, the top tier of the Romanian football league system. Chart of yearly table positions of Steaua in the first division. Steaua was founded on 7 June 1947 at the initiative of several officers of the Romanian Royal House. The establishment took place following a decree signed by General Mihail Lascăr, High Commander of the Romanian Royal Army. The club's first name was ASA București (Asociația Sportivă a Armatei București – Army Sports Association). It was formed as a sports society with seven initial sections, including football, coached by Coloman Braun-Bogdan. ASA was renamed CSCA (Clubul Sportiv Central al Armatei – Central Sports Club of the Army) in 1948 and CCA (Casa Centrală a Armatei – Central House of the Army) in 1950. In 1949, CSCA won its first trophy, the Cupa României, defeating CSU Cluj 2–1 in the final. Under the name of CCA, the club managed to win three Championship titles in a row in 1951, 1952 and 1953, along with its first Championship–Cup double in 1951. During the 1950s, the so-called CCA Golden Team became nationally famous. In 1956, the Romania national team (composed exclusively of CCA players) played Yugoslavia in Belgrade and won 1–0. In the same year, CCA, coached by Ilie Savu, became the first Romanian team to participate in a tournament in England, where it achieved noteworthy results against the likes of Luton Town, Arsenal, Sheffield Wednesday and Wolverhampton Wanderers. At the end of 1961, CCA changed its name once again to CSA Steaua București (Clubul Sportiv al Armatei Steaua – Army Sports Club Steaua). The club's new name translated to The Star and was adopted because of the presence of a red star, a symbol of most East European Army clubs, on its crest. A poor period of almost two decades followed in which the club claimed only three championships (1967–68, 1975–76, 1977–78). Instead, the team won nine national cup trophies, for which matter it gained the nickname of "cup specialists". Also during this period, on 9 April 1974 Steaua's ground, Stadionul Ghencea, was inaugurated with a friendly match against OFK Belgrade. Steaua with the European Cup in 1986. 1986 European Cup Final starting lineup. 1989 European Cup Final starting lineup. Under the leadership of coaches Emerich Jenei and Anghel Iordănescu, Steaua had an impressive Championship run in the 1984–85 season, which it won after a six-year break. Subsequently, Steaua became the first Romanian club to reach a European Cup final, which it ultimately won against Barcelona on penalties (2–0 thanks to goalkeeper Helmuth Duckadam saving all four penalties taken by the Spaniards), after a goalless draw. Steaua therefore became the first Eastern European team to claim the title of European champions. An additional European Super Cup was won in 1987 against Dynamo Kyiv. Steaua remained at the top of European football for the rest of the decade, managing one more European Cup semi-final in 1987–88 and one more European Cup final in 1989 (lost 4–0 to Milan). Notably, this was in addition to its four additional national titles (1985–86, 1986–87, 1987–88,[note 2] 1988–89) and four national cups (1984–85, 1986–87, 1987–88, 1988–89). Furthermore, from June 1986 to September 1989, Steaua ran a record 104-match undefeated streak in the championship, setting a world record for that time and a European one still standing. The Romanian Revolution led the country towards a free open market and, subsequently, several players of the 1980s team left for other clubs in the West. After a short pull-back, a quick recovery followed and Steaua managed a six consecutive championship streak between 1992–93 and 1997–98 to equalize the 1920s performance of Chinezul Timișoara and also three more cups in 1995–96, 1996–97 and 1998–99. At international level, the club also managed to reach the UEFA Champions League group stage three years in a row between 1994–95 and 1996–97. In 1998, the football club separated from CSA Steaua and changed its name to FC Steaua București (Fotbal Club Steaua – Football Club Steaua), being led by Romanian businessman Viorel Păunescu. Păunescu performed poorly as a president and soon the club was plunged into debt. George Becali, another businessman, was offered the position of vice-president in the hope that Becali would invest money in the club. Becali eventually purchased the majority share in 2002 and turned the governing company public in January 2003. Because of his controversial character, he has been challenged by the majority of Steaua fans. The team qualified for the UEFA Cup group stage in the 2004–05 season and became the first Romanian team to make it to the European football spring since 1993 (also Steaua's performance). The next season, Steaua reached the UEFA Cup semi-finals in 2005–06, where it was eliminated by Middlesbrough thanks to a last-minute goal. Steaua thereafter qualified for the following Champions League seasons after a ten-year break, and in 2007–08 Steaua again reached the group stage of the Champions League. Nationally, the club won two titles – in 2004–05 and 2005–06 – and the Supercupa României in 2006, the latter being the club's 50th trophy in its 59-year history. In 2013, Steaua won its 24th national title, and also subsequently reached the 2013–14 UEFA Champions League group stage. It repeated the former performance in each of the next two years, being awarded the championship in 2014 and 2015. After the Ministry of National Defense sued FC Steaua București in 2011, claiming that the Romanian Army were the rightful owners of the Steaua logo, colours, honours and name, the Executive Committee of the Romanian Football Federation approved an application to modify the name of the club from "SC Fotbal Club Steaua București SA" to "SC Fotbal Club FCSB SA" on 30 March 2017, following more judiciary sentences. CSA Steaua București had previously announced they would refound their football department in the summer of the same year. However, owner Becali announced that his team would retain the original honours and UEFA coefficient, and was also hopeful of recovering the name in the near future. ASA București was founded by the Royal Army on 7 June 1947, at which date the club had no official crest. During its first season, 1947–48, Steaua wore yellow and red striped shirts with blue shorts, to symbolize Romania's tricolour flag. Starting with the following season and with the Army's change of identity from the Royal Army to the People's Army, the yellow was gradually given up, so that the official colours remained, up to this day, the red and the blue. As communists assumed total control of the country on 30 December 1947, the Royal Army was transformed into the People's Army and ASA automatically with it. Being inspired by the Red Army, the new Ministry of Defence decided to create a crest for the club, along with the change of name to CSCA, consisting in an A-labeled red star (symbol of the Red Army) on a blue disc. Two years later, the change of name to CCA brought with it a new crest consisting of the same red star labeled CCA surrounded by a crown of laurel. The all-present star motif on the crest finally had its saying over the new name of Steaua as up 1961. It was opted for a badge which, redesigned, remains up to this day the club's symbol: the red and blue striped background with a golden star in the middle, to symbolize to Romanian tricolour flag. The shape for the emblem was redesigned in 1974, once the team moved to Stadionul Ghencea. Following the Romanian Revolution, the Army decided to break all links to the defunct communist regime, so, in 1991, CSA Steaua had a last change of crest with an eagle also present on the Ministry of Defence coat of arms and also on Romania's. As FC Steaua appeared in 1998, the club added two yellow stars on top of the CSA Steaua badge signifying its 20 titles of champions won, along with the Fotbal Club specification. In 2003, the new Board of Administration run by George Becali decided to change the crest, which was a return to the old emblem of 1974–1991, redesigned with the two yellow stars on top. Steaua has never had a standard playing kit. However, the most widely used throughout time was the combination of red shirts, blue shorts and red socks. Other variants have been all-red, all-blue and also shirts in vertical red and blue stripes during the 1960s and 1970s. Other kit colours have very rarely been used. Exceptions were the 1986 European Cup Final in which Steaua wore, for the only time in their history, an all-white kit, the 1999–00 away kit (yellow and red), the 2005–06 third kit (yellow and black), the 2008–12 and 2014–16 away kit (all-yellow), the 2012–14 away kit ( all-sky blue or sky blue shirts with dark blue shorts and socks). For the 2016–17 season, the away kit is all-white. The Ministry of National Defense sued Steaua in 2011, claiming that the Romanian Army were the rightful owners of the Steaua logo, among others. The Supreme Court found in the army's favour, and on 3 December 2014 stripped the football club of its badge. Steaua were forced to play their next home game, against CSM Studențesc Iași, without it on the stadium scoreboard. A new badge was unveiled in January 2015, an eight-sided star containing the letters "FCSB", which would eventually become the official name of the club in 2017. Steaua's kit is manufactured by Nike, who have held the contract since 2002, after a long partnership with Adidas. First team shirt sponsors have been City Insurance since 2013. Previous sponsors include Ford, Castrol, Philips, CBS, Bancorex (initially BRCE), Dialog (currently Orange), BCR, RAFO and CitiFinancial. Steaua played the first three matches in its history at the defunct Venus stadium. Opened in 1931, the venue had previously been in the property of Venus București, a club disbanded in 1949. After that ground's demolition through order of the Communist regime, Steaua played its home matches at any one of Bucharest's three largest multi-use stadia: ANEF, Republicii (built in 1926 and demolished in 1984 to make room for the erection of the Casa Poporului) and 23 August (built in 1953). Of these two, 23 August (later renamed Național) was mostly used when two matches between Bucharest clubs were scheduled in the same matchday or for important European matches, while Republicii for regular matches in the championship. From 1974 to 2015, Steaua played its home matches at the Stadionul Ghencea, a football stadium situated in South-Western Bucharest. Part of Complexul Sportiv Steaua, it was inaugurated on 9 April 1974 when Steaua played a friendly match against OFK Beograd, at which time it was the first football-only stadium ever built in Communist Romania, with no track & field facilities. The stadium was built through order of the Ministry of National Defence inside a former military base and was long used by CSA Steaua. The original capacity was 30,000 on benches. A general renovation occurred in 1991; this included installing seats, which dropped the capacity to 28,365. After a second renovation in 2006, Ghencea was able to host UEFA Champions League events, being a 'Category 3' arena according to the UEFA classification system. The Romania national team was also a tenant for numerous fixtures. From 2011, Steaua played European games and its most important domestic games at the newly constructed Arena Națională, and from March 2015, played exclusively at the Arena Națională. In the 2016–17 domestic league season FCSB drew an average home attendance of 5,067, the best in the Romanian league. Their highest home attendance was 35,000 in that league season. Steaua has the largest number of supporters of any team in Romania. A survey conducted in June 2007 suggested that the club accounts for approximately 42% of all Romanian football lovers, far greater than the teams ranked second and third, Dinamo București, with 12%, and Rapid București, with 9%. The largest concentration of fans are in Bucharest, notably in areas adjacent to the arena, covering the whole southern half of Bucharest, a city geographically divided by the Dâmbovița River. Also, the club has an important fan base inside the country, where several towns are renowned for counting vast majorities of Steaua supporters, and outside the borders, among Romanian emigrants. The Steaua Ultras movement began in 1995, when the bases of Armata Ultra (AU), the first Ultras group from Bucharest (and second in Romania after Politehnica Timișoara's Commando Viola Ultra Curva Sud), were set. The group quickly reached an impressive number of members, but, in 2001, they dissolved due to internal problems. Steaua's supporters then divided into several groups, some of them being located at the Peluza Nord ("North End" – Titan Boys, Nucleo, Insurgenții 1998, Skins 1996, Combat, Armata 47 Vest), while some other ones taking their place at the Peluza Sud ("South End" – Vacarm, Glas, E.R.A., Hunters, Outlaws, Shadows, Roosters, T.K., Tinerii Sudiști). Several important groups such as Stil Ostil, Ultras, Banda Ultra' and South Boys retired from attending Steaua's matches due to the club's constant abuses towards them and, mainly, to the current ownership of Steaua. More recently, as of 2006, the supporters have formed their own official association, called AISS (Asociația Independentă a Suporterilor Steliști – "Steaua Supporters' Independent Association"). AISS was formed as a legal entity with its stated goals of "protecting the interests and image of Steaua supporters", as well as "identifying and promoting the club's perennial values". A heavy debated topic about the fans is the one related to racism. Stemmed from their rivalry with Rapid București, whose fans are often envisioned as Romani ethnics, the issue degenerated on certain situations in several incidents between factions of supporters of Steaua and Rapid. Also, the 2005–06 UEFA Champions League qualifying match against Shelbourne, resulted in a one-matchday pitch suspension for Steaua during the same European season, after racial chants were heard from the crowd. In the 21st century, crowd turbulence has been one of the club's main problems. Liga I matchday suspensions and UEFA suspensions have been dictated against the Ghencea-based club out of reasons such as crowd trouble, racial chants or torch lighting. In 2009, UEFA ordered Steaua to play two home games of the Europa League behind closed doors due to their fans displaying racist banners in a second qualifying round match against Hungarian side Újpest. Three further incidents occurred in the 2014–15 season, with the club fined and ordered to play further games in an empty stadium after displays of racist banners in matches against Dynamo Kyiv, Ludogorets Razgrad and Strømsgodset. Steaua's most important rivalry is the one against Dinamo București. Eternul derby ("The Eternal Derby") has been the leading Romanian football encounter since 1948, as Steaua and Dinamo are the two most successful football teams in the country. There have been more than 150 matches played so far between Steaua and Dinamo in the Romanian League, the Romanian Cup and also the Romanian Supercup. With 44 titles combined (Steaua – 26; Dinamo – 18), the two sides have won 36 more than the third-most successful Liga I club, Venus București. It is also a match between the former clubs of the Romanian Army (Steaua) and the Ministry of Internal Affairs (Dinamo). Several clashes between different factions of supporters have often occurred and still occur inside and outside the stadium. The heyday was reached before a match kick-off in 1997, when Dinamo's fans set a sector of Stadionul Ghencea's Peluza Sud, where they were assigned, on fire. On 16 August 2016, during Steaua's Champions League play-off 0–5 loss to Manchester City, undercover Dinamo fans displayed a huge message saying Doar Dinamo București ("Only Dinamo Bucharest"), which was labelled one of the biggest pranks in football history. Between October 1991 and April 2000, Steaua counted 19 undefeated official matches in front of their rivals, both in the championship and the cup. Just as well, a period of 17 years and 7 months has been recorded in which Dinamo did not manage to win away against Steaua in the domestic league. The second-most important rivalry was with Rapid București. Several matches throughout the years between Steaua and Rapid have also ended in serious clashes between fans. The conflict has become even fiercer after Steaua outpassed Rapid in an all-Romanian quarter-final of the 2005–06 UEFA Cup. The local sports newspapers said that the two teams were linked up in this quarter-final by the line of the number 41 tram which links the Ghencea Stadium to the Valentin Stănescu Stadium. Milder and historical rivalries are also with non-Bucharest-based teams, such as CFR Cluj, Universitatea Craiova, Politehnica Timișoara, Petrolul Ploiești, Universitatea Cluj and a recent one with Astra Giurgiu. Steaua has previously been known as the club of the Romanian Army, which founded it in 1947 as a sports society. The Army continues to own the sports society, named CSA Steaua București. The football department, however, in order to comply with UEFA rules, separated and turned private in 1998, owned and financed by a non-profit organization called AFC Steaua București, chaired by businessman Viorel Păunescu. In January 2003, the team turned public under the leadership of investor and former politician George Becali, who had already purchased 51% of the society's shares and later on acquired the rest to become the owner of the club. At present, Becali has no official links with Steaua, as he gradually renounced his shares. However, the facts that the current shareholders, that include several nephews of his, are people loyal to him and that he is still in charge of Steaua are obvious. An unofficial explanation for this situation is represented by the heavy amount of unpaid taxes added up by the former governing company, AFC Steaua București, whose payment towards the tax authority was avoided this way by transferring its assets to the new-formed company, with the old association going on liquidation bankruptcy. George Becali is a highly controversial figure at Steaua, whose involvement in the life of the club and the team has often been described as authoritarian and dictatorial by both the media and the fans. As Steaua is currently the most popular football team in Romania, a good number of musicians or TV and film directors have inspired themselves from ideas linked to the Ghencea-based club. Popular reference, however, appeared only after the Romanian Revolution, as before, mass-media programmes were mostly being controlled by the former communist regime. The 2002 Romanian film Furia depicts scenes in which Steaua and Dinamo gangs of supporters are fighting on the streets after a direct match between the two sides. Prima TV comedy show Mondenii often airs sketches parodying Steaua owner George Becali, the players and other representatives around the club. Pro TV series La bloc aired an episode in which characters Nelu and Costel are displayed as representing Steaua in a parking lot match against two other neighbours representing Dinamo. Several other examples from music can be attributed as Steaua-related. Apart from club anthems played throughout time by Marcel Pavel, Bere Gratis, Gaz pe Foc, an album was released in 2006 as a compilation by Mircea Vintilă, Chicanos, Bogdan Dima and several other artists. Delikt and Ultras are two former hip hop bands whose members ranked the defunct Armata Ultra' brigade and would always show up displaying fan materials. Also, Voltaj, in their song 'MSD2', make reference to the fans in the line "Poți să fii câine sau poți fi stelist" ("You can be a dog or you can be a Steaua fan"). One of the most famous pop-culture references about the club is the association with Scooter's song Maria, first sung spontaneously in 2003 by the fans in Peluza Nord after the team would score. Ever since, it has been adopted as an unofficial club anthem and is being played at the stadium at every match, sung together by the supporters. Nonetheless, the song is beginning to lose popularity, mainly because it has become too commercial and many fans do not feel bonded with it any more. Note: As of June 2018, UEFA and LPF regard FCSB as the continuation of historic FC Steaua and attribute all honours since 1947 to this entity. However, the ownership of the many trophies won between 1947 and 2003 is disputed, with the restarted football department of former parent club CSA Steaua also claiming them following legal disputes between the two organisations. For a list of the club's most important players throughout time, see List of FC Steaua București players. Steaua currently boasts itself with the most impressive pedigree in Romania. With 62 seasons spent in Liga I, they are one of only two teams to have played only in the first national league, along with Dinamo București (61 seasons). At the same time, the club is the current record holder for the number of national championships (26), national cups (22), national super cups (6) and the national league cup (2). Between 1993 and 1998, its run of six consecutive national titles won equaled the one of Chinezul Timișoara from the 1920s. Internationally, it is the only Romanian club to have won continental trophies (the European Champions Cup in 1986 and the European Super Cup in 1986) and to have played in the final of the European Cup (in 1986 and 1989). For three years and three months (June 1986 – September 1989), Steaua counted a number of 104 unbeaten matches in the league, establishing, at that moment, a world record and a European one still standing. Also inside the national league, the club counted 112 matches between November 1989 and August 1996 of invincibility at Stadionul Ghencea in Liga I. Its run of 17-straight wins in 1988 is another record, equal to the one held by Dinamo as of one year later. Tudorel Stoica is the player with the most appearances for Steaua in Liga I, a record unlikely to be broken in the nearby future, as none of the current players have entered the top-ten so far. The club's all-time top scorer in the league is Anghel Iordănescu with 146 goals, a record that also looks solid, out of the same reason as above-mentioned. Other records are currently owned by former players such as Dorinel Munteanu (most national caps – 134) or Gheorghe Hagi (most goals scored for Romania – 35; most appearances of a Romanian player in the European cups – 93). ^ Although the club is considered for the most part to be the continuation of historic FC Steaua, with UEFA and LPF attributing all honours to this entity, in March 2017 it was decided to change the name from "Fotbal Club Steaua București" to "Fotbal Club FCSB" following legal disputes with the CSA Steaua sports club, which refounded their football department the summer of that year. ^ Steaua București gave up the trophy in 1990. ^ a b c "Deciziile Comitetului Executiv din 30 martie 2017" [The Executive Committee's decisions on 30 March 2017]. Romanian Football Federation. 30 March 2017. Archived from the original on 31 March 2017. Retrieved 30 March 2017. ^ "Am cucerit Europa şi-n tribune! » Steaua – Chelsea a fost urmărit de cei mai mulţi suporteri dintre meciurile din optimile Europa League". ^ a b "Record de voturi intr-un sondaj pe site! 120.000 de oameni au ales: FCSB (Steaua) sau CSA (Steaua)! REZULTATELE SONDAJULUI" [Voting record for an online poll! 120,000 people have chosen: FCSB (Steaua) or CSA (Steaua)! THE RESULTS OF THE POLL] (in Romanian). Sport.ro. 3 April 2017. Retrieved 27 October 2017. ^ a b c d e f g h "Profile: Fotbal Club FCSB". UEFA.com. Retrieved 1 November 2017. ^ a b "Liga 1 Betano: Cifrele vicecampioanei FCSB" [Liga 1 Betano: The records of vice-champion FCSB]. Liga Profesionistă de Fotbal. 4 June 2018. Retrieved 5 June 2018. ^ a b "Ultima zi cu "Steaua" » Anunţ-şoc făcut de Becali: "De mâine e gata" » Anunț IMPORTANT despre palmaresul echipei" [Last day as "Steaua" » Shocking statement made by Becali » Important announcement about the club's honours]. Gazeta Sporturilor (in Romanian). 29 March 2017. Retrieved 29 March 2017. ^ a b "Steaua Bucharest change name to FC FCSB". Special Broadcasting Service. 31 March 2017. Retrieved 25 April 2017. ^ "Întîia cucerire a Occidentului!" (in Romanian). Gazeta Sporturilor. 14 February 2012. Retrieved 21 May 2013. ^ "Cupa Romaniei: STEAUA – Otelul Galati". FCSteaua.ro. ^ a b "Ghencea Stadion". StadiumGuide.com. ^ "Unbeaten in the Domestic League". RSSSF.com. Retrieved 2015-06-04. ^ "Romania – List of Champions". RSSSF.com. Retrieved 2007-07-07. ^ a b Besutiu, Andrei. "Politica mineaza sportul românesc". Ziua. Archived from the original on 30 September 2007. Retrieved 10 June 2007. ^ Petrache, Bogdan; Predan, Cristian. "Conducatorii vor plati cu averea datoriile cluburilor". 9am.ro. Retrieved 2007-07-07. ^ "Planurile lui Becali". Evenimentul. Archived from the original on 30 September 2007. Retrieved 11 June 2007. ^ a b Necula, Simona. "Suporterii echipei Steaua au protestat impotriva patronului clubului". Realitatea Românească. Retrieved 2007-07-07. ^ a b "From racism and homophobia to peace and religion: Is Gigi Becali really a changed man?". Goal.com. 10 April 2015. Retrieved 2 November 2017. ^ a b "The most offensive owner in world sports is sadly not Donald Sterling". Washington Post. 28 April 2014. Retrieved 2 November 2017. ^ a b "Racist, sexist and an MP, meet Gigi Becali, the owner of Steaua Bucharest". Retrieved 2 November 2017. ^ "Steaua a cucerit al 50-lea trofeu din istoria clubului". HotNews.ro. Retrieved 2007-07-07. ^ a b c d Rosu, Emmanuel (27 December 2014). "Where the team has no name: the fight over Steaua Bucharest's identity". The Guardian. Retrieved 8 January 2015. ^ "Becali a dezvăluit, în direct la Digi Sport, motivul pentru care de mâine echipa sa îşi va schimba numele" [Becali unveiled the reason why his team will change its name tomorrow] (in Romanian). Digi Sport. 29 March 2017. Retrieved 31 March 2017. ^ "Şi-au pus antrenor, acum aduc jucătorii. Lăcătuş: "Până la jumătatea lunii iulie, vrem să începem pregătirea cu 25-26 de jucători"" [They named a head coach, now they bring players. Lăcătuş: "Until mid-July, we wish to start the training with 25-26 players"] (in Romanian). Pro Sport. 29 March 2017. Retrieved 29 March 2017. ^ "Zbuciumata infiintare a Stelei". Archived from the original on 23 July 2011. ^ Mircea Ionnitiu (22 October 2003). "Mircea Ionnitiu : "30 decembrie 1947"". Kent State University. Archived from the original on 25 October 2012. Retrieved 2007-07-07. ^ "Steaua Bucharest reveal 'Clip Art' logo after being stripped of their name, colours and emblem". Eurosport. Yahoo!. 7 January 2015. Archived from the original on 12 January 2015. Retrieved 8 January 2015. ^ "Steaua renunta la Adidas pentru Nike". adevarul.ro. Archived from the original on 28 September 2007. Retrieved 12 August 2007. ^ "Steaua are din nou un sponsor pe tricou. Cine este și câți bani primesc roș-albaștrii" (in Romanian). Dolce Sport. 27 September 2013. Archived from the original on 2 October 2013. Retrieved 27 September 2013. ^ "Steaua ca brand". iaa.ro. Archived from the original on 17 June 2008. Retrieved 12 August 2007. ^ Flintoaca, Diana (18 September 2004). "CU CITIFINANCIAL PE TRICOURI". ProSport. Archived from the original on 21 September 2007. Retrieved 2007-09-18. ^ "Venus București". romaniansoccer.ro. Retrieved 2007-08-27. ^ "UEFA Stadium Guide". UEFA.com. Archived from the original on 5 August 2007. Retrieved 17 July 2007. ^ "Dinamo nu vrea in Ghencea". 9AM. Archived from the original on 2014-08-06. Retrieved 2014-07-30. ^ "Istoric – PALMARES ALL-TIME". frf.ro. Retrieved 2007-07-07. ^ "Liga 1 2016/2017 – Attendance". worldfootball.net. ^ a b "42% dintre români sunt stelisti". Ziarul. Retrieved 2007-07-14. ^ "Armata le dadea papara..." FCSteaua.ro. Retrieved 2007-07-07. ^ "Istoria ultra' incepe cu noi!". FCSteaua.ro. Retrieved 2007-07-07. ^ "Comunicatele grupurilor Vacarm, Ult*ras, STIL*OSTIL, Banda Ultra". FCSteaua.ro. Retrieved 2005-09-10. ^ "AISS va prezinta AISS.ro". aiss.ro. Retrieved 2007-07-07. ^ "Steaua acuzata din nou de rasism". roportal.ro. Retrieved 2007-09-06. ^ a b "Rapid – Steaua / dusmanie nula". PresaOnline.com. Archived from the original on 27 September 2007. Retrieved 14 June 2007. ^ "Steaua are terenul suspendat pentru meciul cu Valerenga". hotnews.ro. Retrieved 2007-10-07. ^ "Steaua Bucharest to play behind closed doors". sports.yahoo.com. Retrieved 2009-08-09. ^ "Steaua Bucharest punished by Uefa after racist behaviour by fans". The Guardian. 25 February 2015. Retrieved 8 April 2015. ^ "Marele derby (the great derby)". footballderbies.com. Retrieved 2007-07-07. ^ "Romania – List of Champions". rsssf.com. Retrieved 2007-08-11. ^ "Marele derby (the great derby)". footballderbies.com. Retrieved 2007-08-11. ^ "Lista completa cu derbyurile campionatului". fanatik.ro. Archived from the original on 28 September 2007. Retrieved 2007-07-07. ^ "Gigi Becali si-a vandut toate actiunile de la Steaua nepotilor sai". Archived from the original on 29 September 2007. Retrieved 6 September 2007. ^ "Cine mai conduce Steaua". Archived from the original on 27 September 2007. Retrieved 11 June 2007. ^ Chican, Marius; Focseneanu, Dorin. "Romanii platesc datoriile Stelei". evz.ro. Archived from the original on 13 October 2007. Retrieved 2007-09-06. ^ Traciuc, Alexandru. "Romanii platesc datoriile Stelei". gardianul.ro. Archived from the original on 2007-11-03. Retrieved 2007-09-25. ^ "Intamplari de la filmari..." cinemagia.ro. Retrieved 2007-08-12. ^ "Mondenii – episodul 1 – secventa cu Gigi Becali si Banel Nicolita cu Gigi Becali de Mondenii". preferate.ro. Archived from the original on 29 September 2007. Retrieved 12 August 2007. ^ "Compilatie, Forza Steaua (CD)". dol.ro. Retrieved 2007-08-12. ^ "The Red Dogs" is a common nickname adopted by Dinamo's fans for their team. ^ "Versuri "Voltaj – Msd2"". versuri.ro. Retrieved 2007-08-12. ^ "Despre Scooter". fcsteaua.ro. Retrieved 2007-08-12. ^ "Jocuri sportiveb fotbal" [Sporting departments: football] (in Romanian). CSA Steaua București. Retrieved 1 November 2017. ^ "S-a stins Steaua lui Gigi Becali. FCSB preia palmaresul din 2003" [Gigi Becali's Steaua is gone. FCSB keeps historical record only as of 2003.] (in Romanian). Evenimentul Zilei. 30 March 2017. Retrieved 1 November 2017. ^ "Ultima zi cu "Steaua" » Anunţ-şoc făcut de Becali: "De mâine e gata" » Anunț IMPORTANT despre palmaresul echipei" [Last day as "Steaua" » Shocking statement made by Becali » Important announcement about the club's honours]. Gazeta Sporturilor (in Romanian). 29 March 2017. Retrieved 1 November 2017. ^ "Trofeele Stelei rămân în ceață. Dănilescu: "Aveam aceeași emblemă și dreptul de a folosi palmaresul și marca"" [Steaua Trophies Stay in the Fog. Danilescu: "We had the same emblem and the right to use the record and mark"] (in Romanian). Digisport. 26 September 2017. Retrieved 1 November 2017. ^ a b c d e f "FCSB - FC Steaua Bucharest official website: Trophies". FCSB. 1 November 2017. Retrieved 1 November 2017. ^ Steaua gave up the trophy in 1990 "Steaua's series of 104 matches unbeaten in the Divizia A". rsssf.com. 2001-09-10. Retrieved 2007-07-07. ^ "Club World Ranking". IFFHS.de. 2017-04-05. Retrieved 2017-04-05. ^ Kassies, Bert. "UEFA Team Ranking 2017". xs4all.nl. Retrieved 4 January 2017. ^ "Prima echipă" [First team squad] (in Romanian). FC Steaua București. Retrieved 23 February 2018. ^ "FOTBAL CLUB FCSB" (in Romanian). Liga Profesionistă de Fotbal. Retrieved 6 August 2018. ^ "Schimbare de ultim moment » Massimo Pedrazzini a fost înlocuit" (in Romanian). Gazeta Sporturilor. 2015-08-01. Retrieved 2015-08-01. ^ "Steaua's series of 104 matches unbeaten in the Divizia A". www.rsssf.com. Retrieved 26 May 2012. ^ "Inter Milano a egalat recordul tandemului Steaua – Dinamo". 7plus.ro. Archived from the original on 27 September 2007. Retrieved 3 September 2007. ^ "Istoric Antrenori". steauafc.com. Retrieved 9 March 2013. Wikimedia Commons has media related to FC Steaua București.